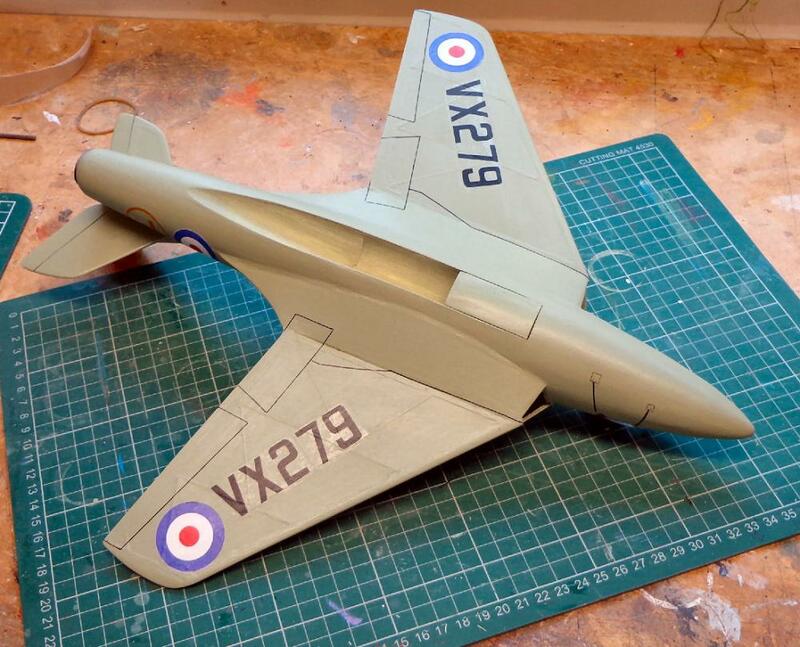 It was good to see Howard's new F-4 Phantom and refurbished MiG 15 flying reports posted on the forum 'Flying' thread. this I have not done No excuse really, except things have been busy at Jetex Towers and Jetex Jim is feeling his age. But I really don't like spraying, and I spent like forever trying to sort out the decals - getting the sizes correct and the correct lettering etc. 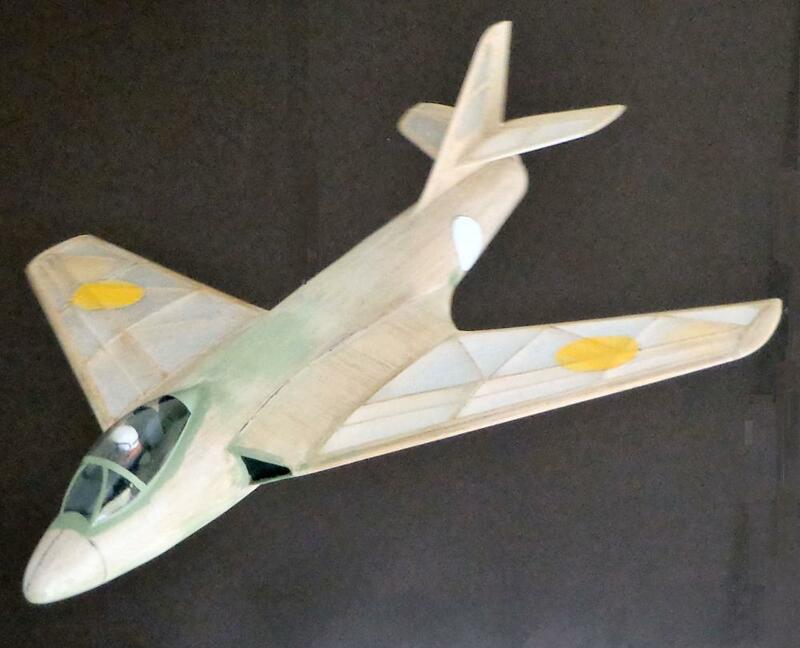 The original WM FW was built on a jig 'up in the air' -- not easy and as the slotted wing spars were none too accurate little asymmetrical warps could too easily creep in. This may explain the problems some folk have had trimming this model. 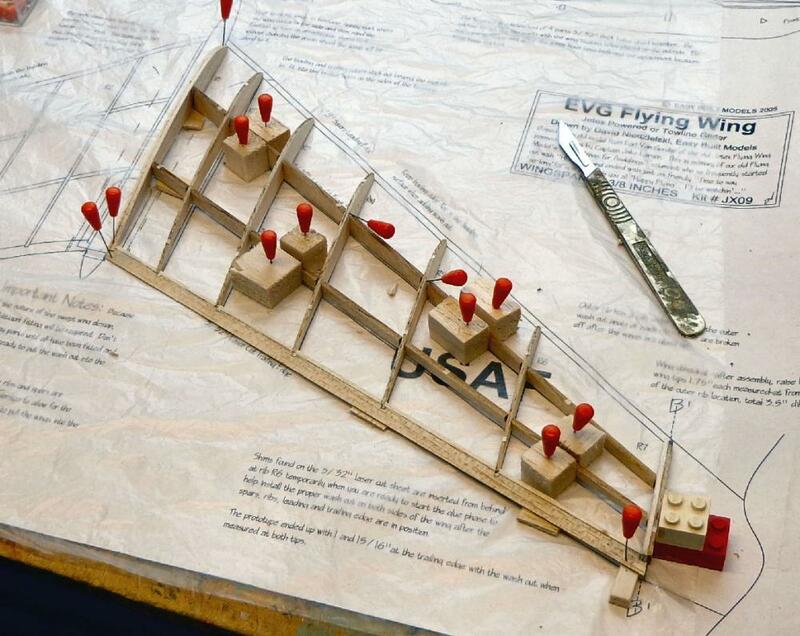 In contrast, the wings of the EVG version are built flat on the building board with 3/16" washout built in (the tip ribs come with tabs - clever!). 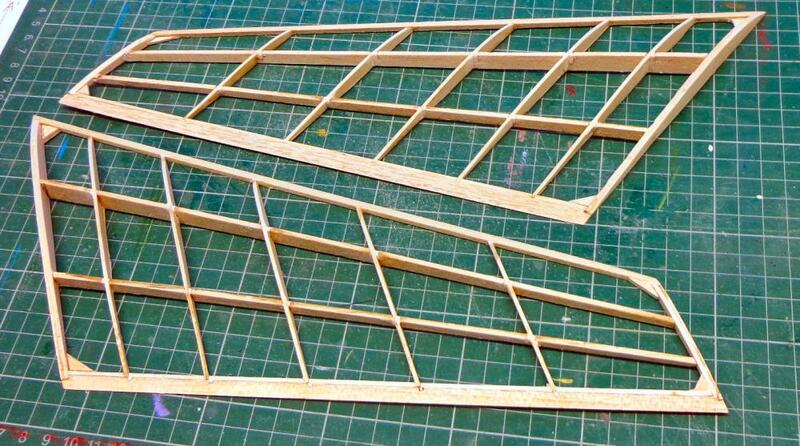 Even so, care must be taken to keep things square- note the small balsa blocks to line-up the spars. 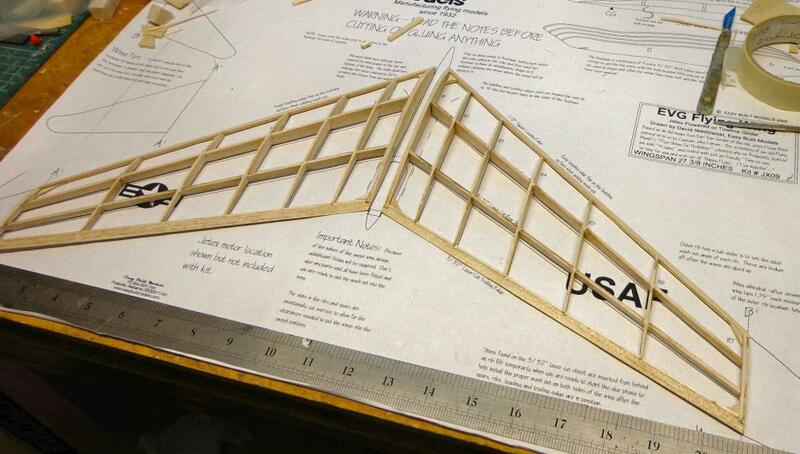 The spars' oversized slots have to be 'filled in' after gluing in the rips (like the riginal) --I used a lightweight filler which worked well (what did the use ih 1951 - little bits of balsa? Very fiddly!). Note I added a harder 1/16" strip to the leading edge, soft 1/16" strip to the trailing edge to take the ribs (slotting a trailing edge weakens it badly, very bad practice) and triangular strengthening gussets at the root and tip. Not in the plan, but old habits die hard. I covered the model with wet lightweight Modelspan, gluing the tissue with dilute PVA glue to the undercambered ribs. Will my careful building pay off? 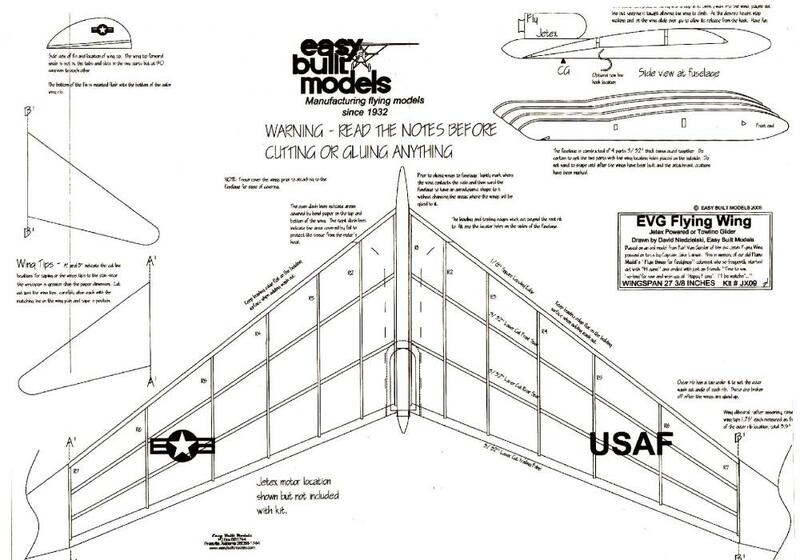 Will it glide 'off the board' or will I have to reset the wing tips to compensate for ... whatever - an all too common experience of Flying Wing builders? 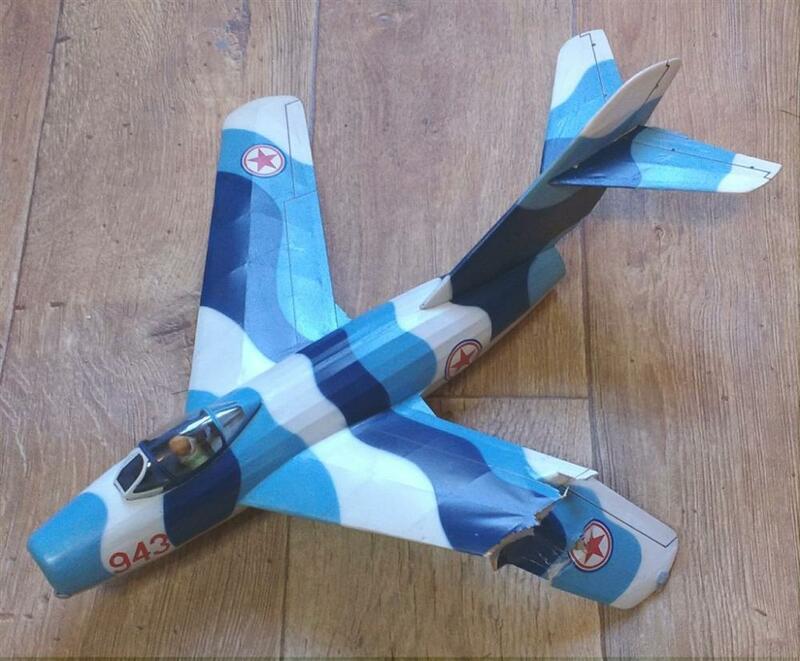 So after stripping the wing, doing the repairs, recovering it and repainting, it is finally finished and ready to test fly. In the process I took out the hidden warp I missed after the rebuild and the test glides now look good. Fingers crossed. My wife says it is the prettiest model I have ever built, I think she might be right. Your finishing skills put mine to shame. Your good lady has excellent aesthetic judgement! Not sure about the trough, though - my MiG 15 has a trough with downthrust , but a smooth exit about 2" from the tailpipe. It's easily my best flyer (eg at the blustery 2016 Peterboro Flying Aces) and can cope with any moto from 100 mN up to an L-2X. Roll on Old Warden -- what's the forecast? 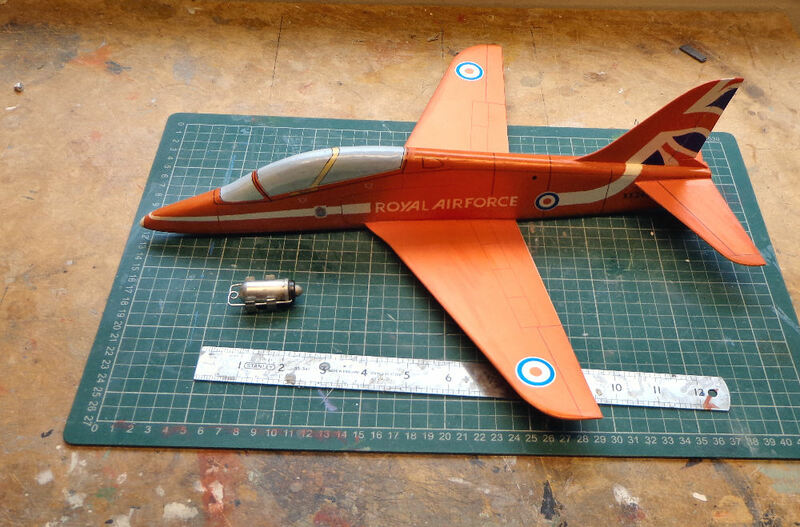 As the weather looks none too good for Old Warden, I decided to finish another profile model more suitable for the predicted conditions. The colours are somewhat translucent, and tangerine rather than red. I could match the colours if not the texture when tidying up the edges. 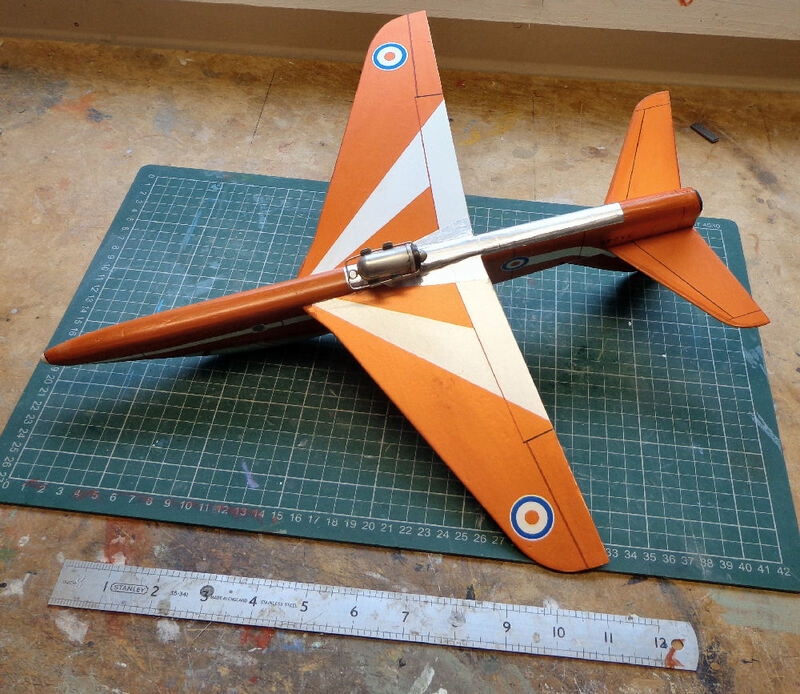 It weighs about 39 grams without motor, so I'm hoping to trim it out with a Rapier L-2 and original Jetex 50 B before trying a Jetex 50C which, I hope, will propel it through some authentic aerobatics. Quite pleased with the results: the paint is quite light and covers well, but came out a little darker than I would have liked. It really needed, I think, a fair bit of white and a touch of blue to achieve an 'authentic 'eu de nil' of the prototypes. 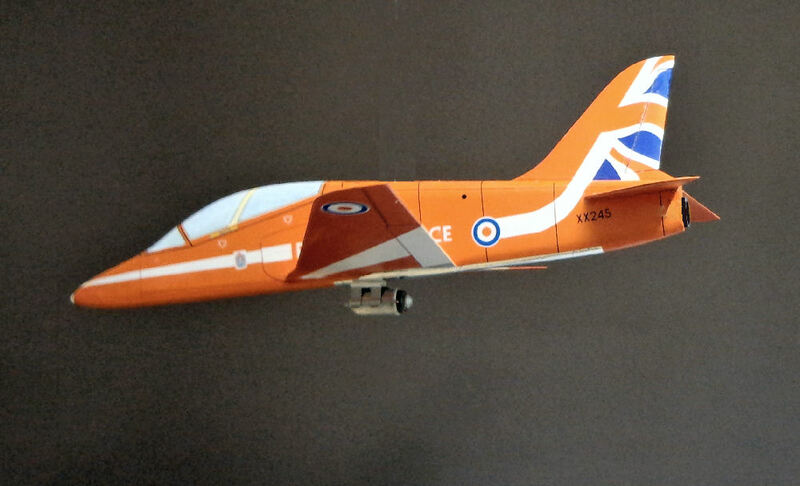 The panel lines etc were drawn with a fine Staedler 'permanent' pen, and the decals were made with 'Experts Choice' white and clear decal sheets. 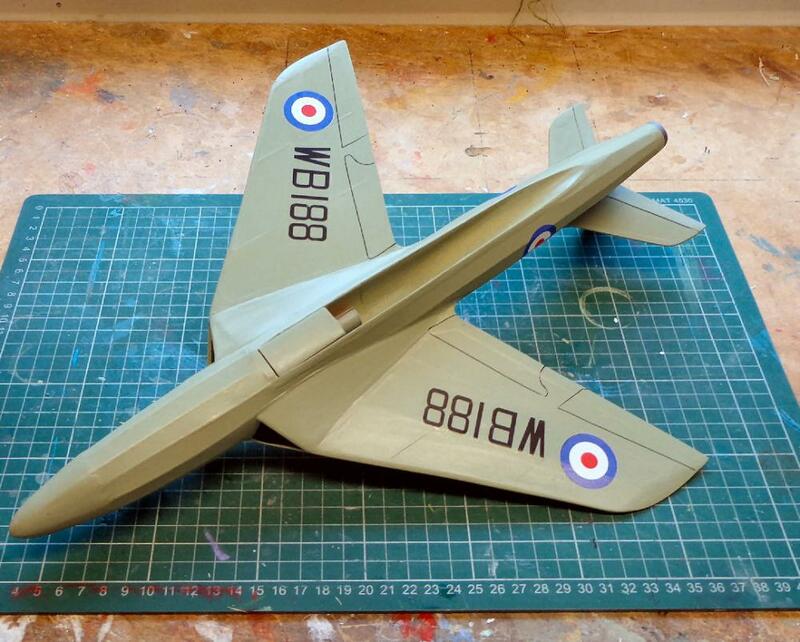 I finished with a coat of 'Vallejo' clear acrylic resin, 'gloss for the canopy and satin for the rest of the model. 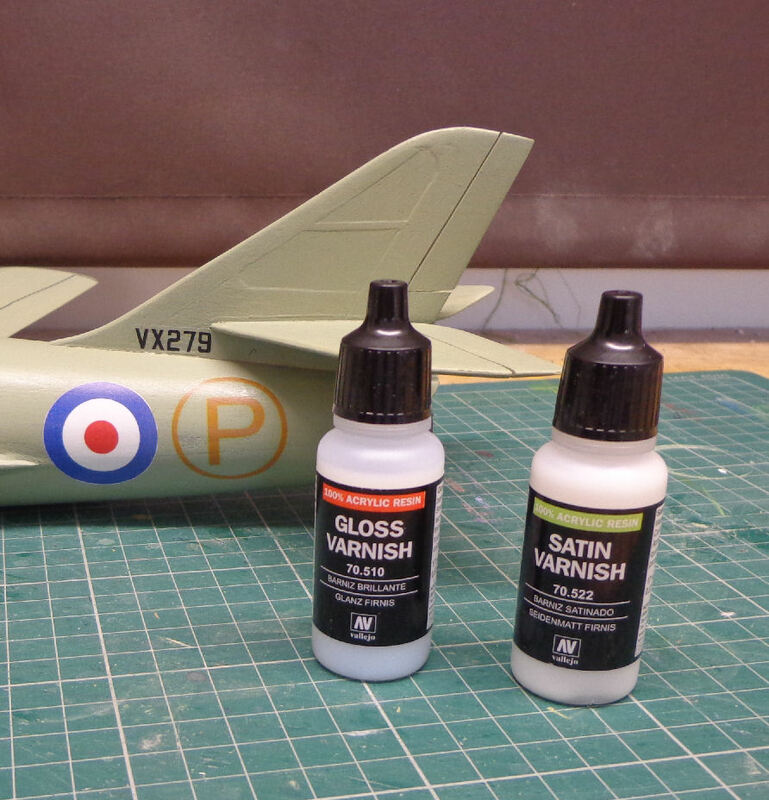 This stuff is recommended by plastic scale modellers (OK, you know what I mean) and it brushed on as well as Johnson's 'Klear' of fond memory. It adds very little weight. I was a bit worried about the weight of the P. 1081: glide tests showed it needed over 6 grams in the nose . 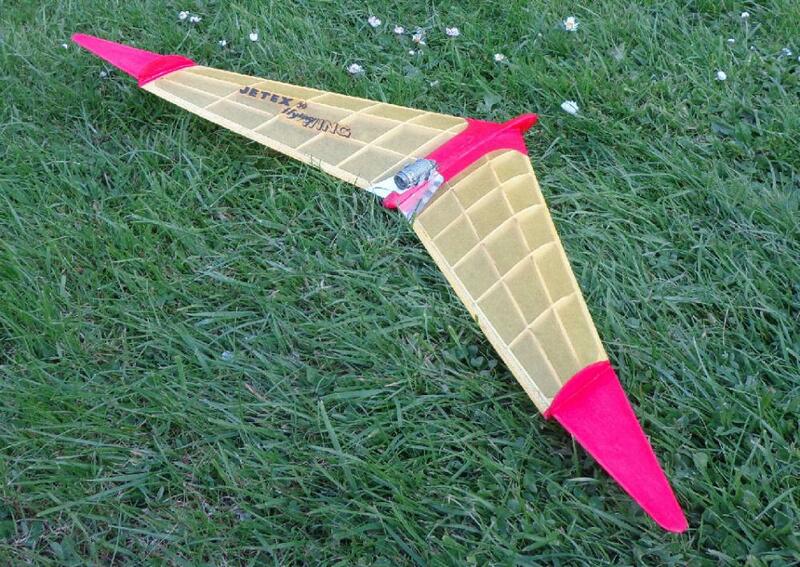 and it's approaching 50 grams ready to fly. 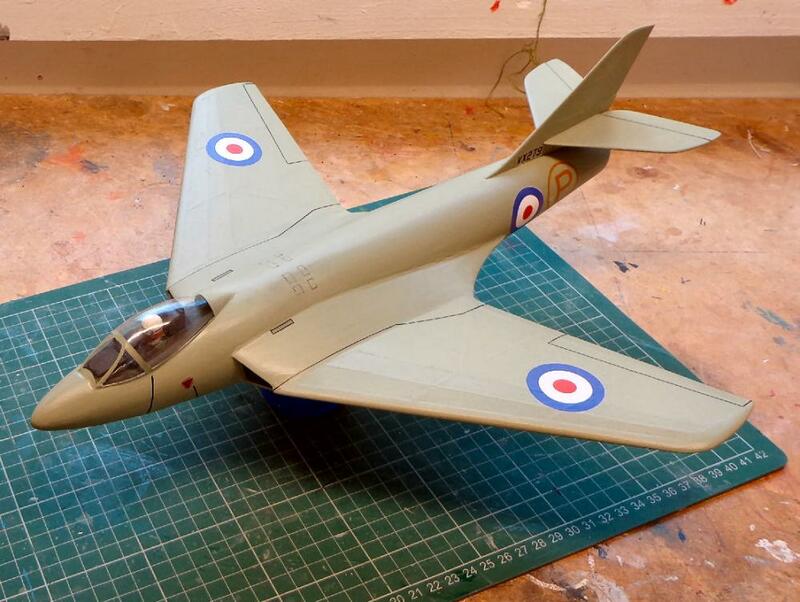 This seems a lot, but as the P. 1081 has a fair bit of wing area it equates to about 6.3 oz/sq ft (sorry about the units, but it's what I'm used to). 6.3 oz/sqft is very reasonable, and as the model has little drag it should be OK with a Rapier L-2 up its jet pipe. We shall see - look for the exciting flying thread soon to appear! 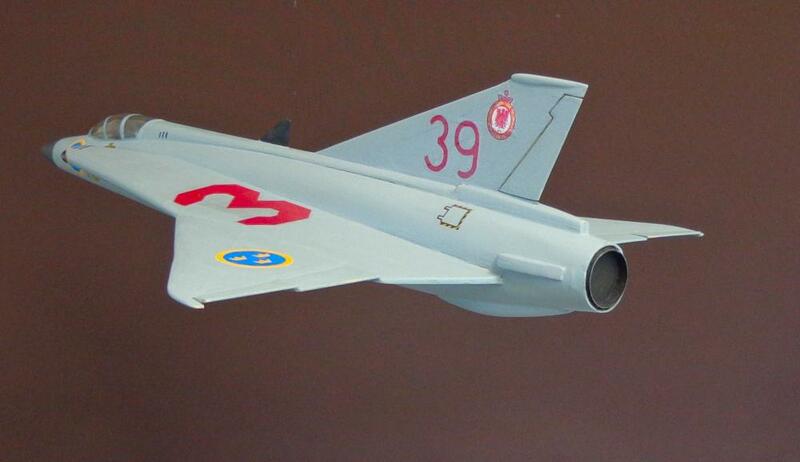 I don't get out as much as I used to, and the weather not being suitable for trimming my latest models, I decided to finish the moulded Draken that I started all of four years ago. I added a trough for the Rapier and a new canopy (without pilot, I've learned my lesson! ) 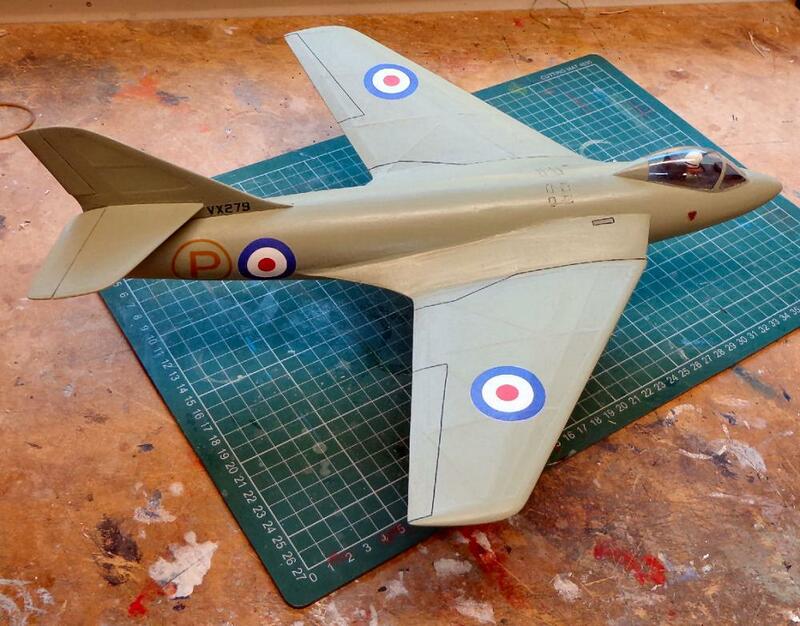 and sprayed with Tamiya 'sea grey'. This needed a fair bit of white before it looked half-right, and still came out bluer than I would have liked. I sprayed two coats, the first being rubbed down and then a second lighter coat. This added 1.6 grams - not too bad. 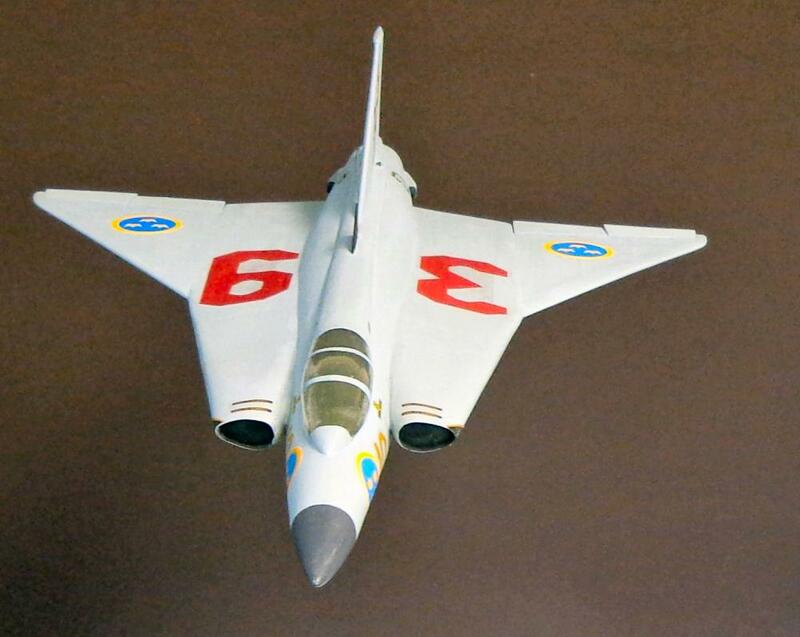 Above: This is my second Draken. 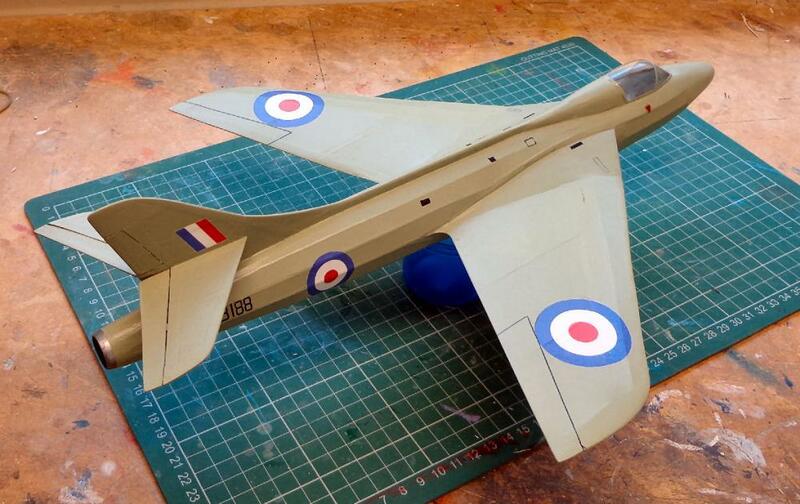 The first features a Rapier L-2 mounted on a 'weapons pod'. 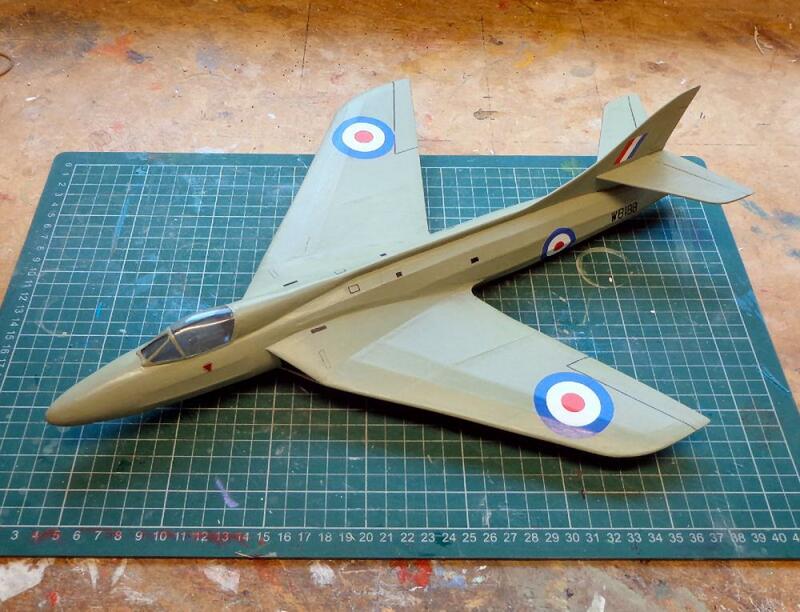 This one has a trough - it will be interesting to compare flying characteristics. This clears my building board. Now I need to get out flying. After all this work, I really hope they all do fly!